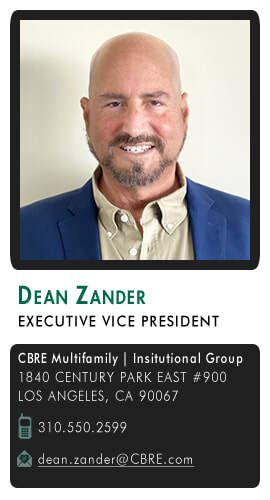 ​​Dean Zander has recently transitioned to CBRE as an Executive Vice President in the firm's Capital Markets Group. For thirty years he has established himself as the leader in the multifamily arena by creating value for his clients through his extensive market knowledge, resolved work ethic, and strong commitment to excellence. Zander joins CBRE after 18 years at Berkadia where he was annually featured among the Top 5% Most Successful Agents companywide. Experience and professionalism direct Dean’s efforts toward long-term relationships rather than transaction-oriented business. He is committed to the highest level of client service and ethical standards. Eric Thompson brings to the team nearly twenty years of investment real estate analysis and marketing. Eric has been deeply involved in more than $4 billion of team transactions, constantly demonstrating unwavering attention to financial detail and presentation quality. He is tasked with updating and renewing presentation and marketing material layouts incorporating the most current technologies and formats. Apart from his dedication to work, Eric is an accomplished pilot and enjoys spending time with his wife, two daughters, and their chickens. Ginger Bevilacqua brings 8 years of real estate and marketing experience to the team. During her six-year tenure with CBRE, she has gained extensive experience in utilizing the CBRE platform to maximize property exposure, and assists in the creation of best-in-class marketing collateral. Ginger facilitates the efforts involved in creating strategic marketing campaigns for the team’s multifamily listings. In addition, Ginger assists in managing the escrow process, and supervising the assembly and organization of due diligence materials.